Brands are turning to online events as a key part of their lead generation efforts—everything from scheduled webinars to live streaming on Facebook—more than ever before. Why? Used throughout the buyer’s journey, these digital touchpoints can help advance prospects through the funnel, generate leads, and offer valuable information to buyers after their purchase that builds relationship and helps brands like yours retain mindshare. To get the most out of your online event initiatives, wouldn’t it help to better understand important trends ranging from attendance to engagement? The answer is a resounding yes! 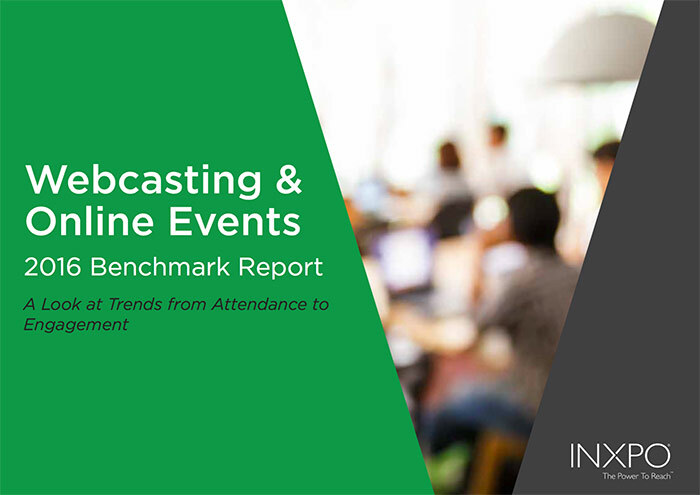 It’s your lucky day because a report from INXPO—Webcasting & Online Events 2016 Benchmarking Report—provides that valuable perspective and analysis you can leverage to get more traction from your 2017 digital event schedule. Even better? It can help you nail the lead generation you seek as part of your integrated marketing efforts. The report, for example, points out 39 percent of registrants to webcasts attend live compared to 45 percent of registrants for other online events. Some of those live viewers—10 percent and 16 percent, respectively—even returned to view that same content again on-demand. When it comes to engagement, INXPO’s research found interactivity is king: Sixty-seven percent of attendees generally respond to live polls during webcasts, for example, turning a presentation into a conversation. The data also reinforces consumers’ collective penchant to view content on mobile devices. What does that mean for you? Tailoring your online events for a mobile audience can ensure audience participation from their device of choice. There’s more to discover. Do you want to know the best days and times to schedule online events and webcasts for increased viewership? How about how far in advance you should start requesting registrations? Do you know the sweet spot for how long these digital events should last for maximum impact? What social media platforms are best for adding interactivity? When it comes to content, how should you balance the use of slides, videos, and documents? Lots of questions, huh? We have answers. Don’t waste time and resources by winging webcasts or online events in 2017. Instead, nail your lead generation efforts, download this FREE 2016 Benchmarking Report from INXPO to be in the know.